The creators of a revolutionary AI system that can write news stories and works of fiction – dubbed “deepfakes for text” – have taken the unusual step of not releasing their research publicly, for fear of potential misuse. OpenAI, an nonprofit research company backed by Elon Musk, Reid Hoffman, Sam Altman, and others, says its new AI model, called GPT2 is so good and the risk of malicious use so high that it is breaking from its normal practice of releasing the full research to the public in order to allow more time to discuss the ramifications of the technological breakthrough. At its core, GPT2 is a text generator. The AI system is fed text, anything from a few words to a whole page, and asked to write the next few sentences based on its predictions of what should come next. The system is pushing the boundaries of what was thought possible, both in terms of the quality of the output, and the wide variety of potential uses. Reminds me of the alarmist and mostly fake stories about how Facebook panicked and “shut down” an experiment in which two bots started to talk to each other in an incomprehensible language. It wasn’t exactly Skynet becoming self-aware, but the headlines tended to make you think that. Granted, I’m probably not doing the OpenAI research justice here. I’m just very skeptical of AI-related stories that contain words like “fear” and “dangerous” in the headline and lead. Archillect, an artificial intelligence that crawls the internet in search of images that people like, is (or was) overdosing on her ever-expanding fame, as a 2016 interview with creator Murat Pak suggests. Art should be popular, but there is a paradox inherent in letting the fans influence an artist’s choices – as her fan base grows, the art loses its edge. It’s an old story, even if the artist in question happens to be made of software. Are there any other cases where you could see Archillect failing catastrophically? In addition to the above, Right now the main problem is how Archillect is destroying herself. Let me explain. Archillect is made as a trend-getter – a bot to understand what on social media is able to get more likes. In its early days, Archillect was almost invisible in terms of her social media power, and this made it much easier to understand what people already like. But now, Archillect has more than 150k followers and reaches more than 8 million people per day, which means that she has the power to affect people’s choices. Because of this power, and because of how Archillect is positioned in people’s minds (with the help of social media) everyone assumes “Archillect is a judge and whatever she picks has to be beautiful.” As a result, even the most random image gets a lot of social media reach. This makes it very hard to understand what is really beautiful or more interesting or more valuable (in terms of potential reach) and makes the criteria get so close to each other that all becomes almost gray. This whole loop is a loop of self-destruction because even though Archillect outgrew herself, she is now losing her power to understand. In other words, it feels like there is no real relation between the number of interactions and social media value of the content. Just recently I’ve tweaked Archillect to depend more on the choices of her earlier followers as opposed to her later ones, and I hope this will help. Simplifying, we can say that Archillect operates in two ways: by searching photos on Tumblr, Flickr or 500px and then posting them on social platforms and eventually observing how they perform. Then she decides which one is considered more interesting on the base of shares and likes. I finally understood the coldness that emanated from that account and its elegant choices. Archillect is an algorithm that feeds its viewers with what they’re looking for, perhaps without them even realizing it. Her visual universe is made of abstract and beautiful images but almost deprived of any emotion. No coincidence that the dominant tones are cold, like grays, blues, blacks, washed-out colors and the materials are usually concrete, metals and plastic surfaces. The collective unconscious hidden desire is polished, perfect, almost without a human presence. Every age has its rituals. 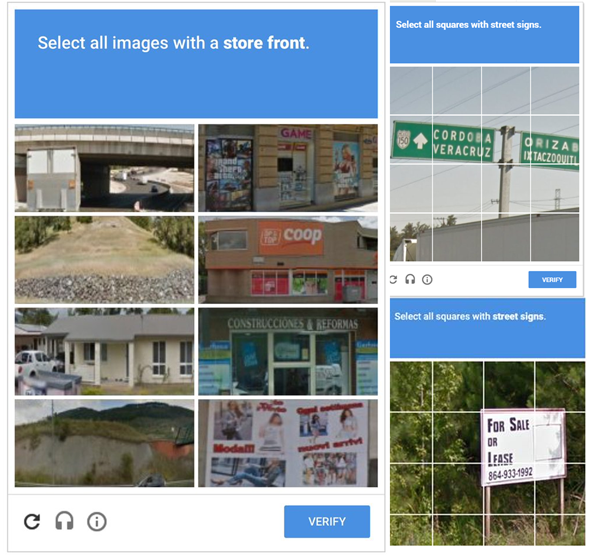 In the Age of Google, we have the Ritual of the reCAPTCHA, a compulsory visual test that requires a carbon-based organism to prove its sentience to a computer by selecting squares that seem to contain grainy images of a specified object. The organism must do this correctly in order to demonstrate to the computer’s satisfaction that it (the organism) possesses the mental faculties of invariant recognition, segmentation, and parsing, in which attributes humans tend to excel over computers. If the organism passes the test, it is permitted to continue with its intended task on the website. That problem is that many human beings who are more or less sentient find the average reCAPTCHA to be hard and frustrating, owing to the intentionally crappy quality of the images, poor visibility of the objects, as well as certain definitional problems that the average internet user is ill-equipped to deal with. For example, should the user, tasked with identifying “street signs,” click on a square that contains part of a sign post? Then there are questions of process. Does the user click Verify immediately after clicking all the relevant squares, or wait for new images to materialize in the squares that have been clicked? None of this is clear, none of it is explained. The user twists in a fog of doubt and confusion, and frequently fails the test. The reCAPTCHA is the reductio ad absurdum of modern life, a grudging surrender of countless man-hours of labor (over 100 million reCAPTCHAs are displayed every day) to feed the ravenous maw of an emerging artificial superintelligence. Because, of course, by completing these image recognition tasks, the human user is training Google’s vast machine learning datasets. TechRadar thanks you for your service in helping develop self-driving cars. But while we are training Google’s neural networks, the machines are simultaneously training us — teaching us to be more compliant, more deferential to the machines, and more conversant in machine logic… in short, remaking humanity in their own image. The future is a slouched hominid clicking on a fuzzy image of a taco shop — forever. The world is being shaped in large part by two long-time trends: first, our lives are increasingly dematerialized, consisting of consuming and generating information online, both at work and at home. Second, AI is getting ever smarter. Some of them have been used for a long time in advertising (e.g. positive/negative social reinforcement), but in a very weak, un-targeted form. From an information security perspective, you would call these “vulnerabilities”: known exploits that can be used to take over a system. In the case of the human mind, these vulnerabilities never get patched, they are just the way we work. They’re in our DNA. They’re our psychology. On a personal level, we have no practical way to defend ourselves against them. The human mind is a static, vulnerable system that will come increasingly under attack from ever-smarter AI algorithms that will simultaneously have a complete view of everything we do and believe, and complete control of the information we consume. Importantly, mass population control — in particular political control — arising from placing AI algorithms in charge of our information diet does not necessarily require very advanced AI. You don’t need self-aware, superintelligent AI for this to be a dire threat. So, if mass population control is already possible today — in theory — why hasn’t the world ended yet? In short, I think it’s because we’re really bad at AI. But that may be about to change. You see, our technical capabilities are the bottleneck here. Until 2015, all ad targeting algorithms across the industry were running on mere logistic regression. In fact, that’s still true to a large extent today — only the biggest players have switched to more advanced models. It is the reason why so many of the ads you see online seem desperately irrelevant. They aren’t that sophisticated. Likewise, the social media bots used by hostile state actors to sway public opinion have little to no AI in them. They’re all extremely primitive. For now. Who knows what will be next. It is quite striking that Facebook has been investing enormous amounts in AI research and development, with the explicit goal of becoming a leader in the field. What does that tell you? What do you use AI/RL for when your product is a newsfeed? Now might be an opportune time to talk about government regulation of the social media platforms. And maybe even a temporary shutdown, until we can figure out what is going on and how to mitigate the risk of social catastrophe from this new and poorly understand technology.